Straightening your hair is a fast way to get your hair ready for a big night out with ladies, although using heat to straighten is harmful and can leave your hair looking frazzled. Cheap straighteners on the market will have you looking good in the short term, but long term is a different story and they can do more harm than good. There are more expensive straighteners that will cause less collateral damage. 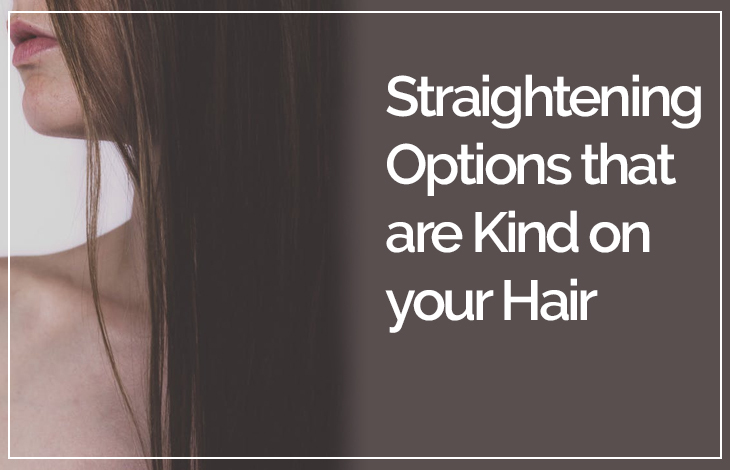 Luckily, there are many natural ways to straighten your hair that will keep your hair in pristine condition and have the same result as a straightener. So this blog post will give you a few options for straightening your hair to keep damage to a minimum. Making a natural straightening from milk and honey. Yes, that’s right milk and honey, believe it not. Make a mixture of 1 cup of milk or coconut milk and one tablespoon of honey. The protein in the milk binds to the hair and straightens while also giving the hair some life. Use Jumbo hair rollers. The bigger the better. The size of a soda can preferably. Roll sections of your hair and secure them to your head. Allow them to completely dry, because the if your hair is slightly wet it will curl again. If you are going to use heat, such as a straightener, use a good one. Shell out and spend an extra $100 and buy something of quality with ceramic heating irons. Ceramic heating irons are better for your because the heat is more evenly distributed and will give you far superior results and cause less damage. GHD is still number one in the ceramic straightening game. Try a cream rather than using heat. A lot of hair straightening creams on the market contain harmful chemicals that will damage your hair the same as a cheap straightener. When choosing your hair straightening cream, try and opt for one with all natural ingredients and change brands until you find one that is suitable for your hair. After all, everybody is different, and everybody’s hair is different, so different creams work better with different types of hair. This age-old simple technique is often overlooked because it seems too good to be true. When you wash your hair, as soon as you get out the shower brush your hair straight and keep brushing until its dry. This process can be time-consuming, but your hair will thank you in the long run. I find it quite relaxing and when I get out of the shower, I pop on some tunes, pour a glass of my favourite red wine, and commence brushing. Not only does this technique make your hair straight, it will massage your skull, increasing circulation in your head and give you healthy hair. If you do go for the chemical straightening options, it’s best to go see your hairdresser. They have been specifically trained on how use the chemicals in a safe manner that will cause little to no damage to your hair. Timing is crucial with hair straightening chemicals and should be left up to the professionals. Don’t try this at home to avoid causing damage to your hair. So if you are deciding to straighten your hair think of the repercussions of using inferior products as they will damage your hair. Try opting for the natural route to keep your hair in pristine conditions for years to come. If you do opt to use chemicals always, seek professional advice or better yet let your hairdresser do for you, for the best results and minimal damage.